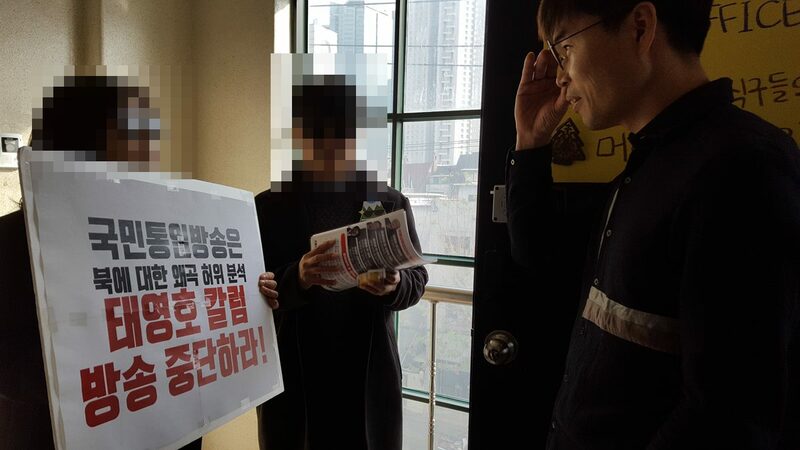 Members of the Paektu Protection Squad, which was created to welcome North Korean leader Kim Jong Un to Seoul, last week visited the offices of the Unification Media Group (UMG) to demand that a regular column written by former North Korean diplomat Thae Yong Ho for Daily NK be cancelled. Daily NK and UMG have jointly published Thae’s column in print and video formats every week from July, with the latest being published earlier this month. 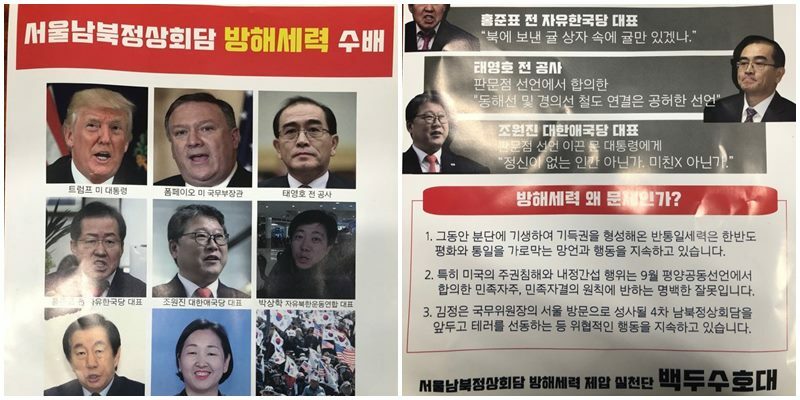 The Paektu Protection Squad’s leaflet, which was handed over to Daily NK representatives, included photos of Thae, President Donald Trump, former Freedom Korea Party head Hong Joon Pyo, Fighters for Free North Korea head Park Sang Hak and six others, and included a promise to meet each of them with the intention to ensure that they won’t interrupt the holding of an inter-Korean summit in Seoul. “It’s unfortunate that young people [today] are still taken in and being impacted by the blind support toward North Korea espoused by some far-left Juche supporters of the 1980s,” he said. “Juche supporters at the time believed that America was the source of division and was preventing unification from happening and that South Korea was a colony of the US,” Lee explained, further noting that the Paektu Protection Squad’s ideas toward the US mirror those espoused by Juche supporters in the 1980s and 1990s. “Thae Yong Ho is presenting a rational plan to bring about peace on the Korean Peninsula by raising awareness of the issues in North Korea and analyzing its foreign policy. 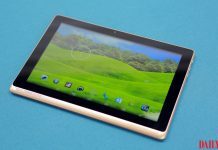 It’s unfortunate that he’s being viewed as an opponent to peace and unification by some,” Lee added.